*FANTASTIC one of a kind Splinting Course. California approved 40-H44 for 9 hours in advanced hand therapy practice. Identify the indications, precautions and contraindications for the use of mobilization splinting for the upper extremity. Distinguish between different levels of evidence that support the use of mobilization splinting for the upper extremity. 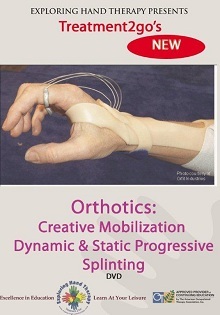 Recognize the mechanical principles involved in mobilization splinting for the upper extremity. Identify the anatomical knowledge base required to fabricate mobilization splints. Identify several different methods to help selection of the appropriate mobilization splint. Gain knowledge of tips and tricks for the fabrication of mobilization splinting for the upper extremity. The BEST way to learn splinting so you watch rewind and replay - NEVER miss a step again! Tips and tricks you won't learn at your average splitning course! This is excatly what I was looking for. Thanks!!! I thought the video was excellent. It was easy to follow & I could take breaks throughout. Right after the course, I ordered the splinting material & tried all the splints. That very next week, I made 2 of my patients splints from that course. Loved the new splinting ideas!